If you have spent any time at all reading this blog over the past year and a half you will have gathered that, as a shallow person, there’s not a whole lot in my day to day life that troubles me. Sure, there are some things that make me sad, lots that make me happy and even a few things that make me want to … well I should probably just let those things go. All and all, if I had to put a label on me, I’d say I’m a laid back kind of gal. Except at four o’clock in the morning when I’m waiting for one of my kids to get home from the bar. No one would call “that woman” laid back. Or when I’m shopping on Boxing Day. Which is perhaps a story for another time. Nope, I can honestly say at this stage of the game I simply don’t come across too many things that irritate me. Which doesn’t mean there’s not a whole lot of stuff I just don’t get. Like jeans with bling. You know how it goes. 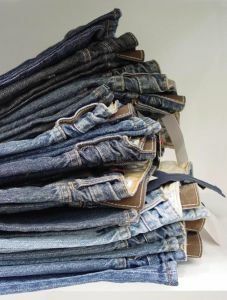 You’re sifting through a rack of what appears to be perfectly decent jeans. Sure some of them are darker than others but there’s nothing inherently wrong with that. And you’re wise enough to know that no good will come of trying on the “skinny”ones so you just pass those by. Anyway, you’ve been wearing jeans long enough to know exactly what you want. Something with 5 pockets, no holes (when you’re from my era you have to come by those honestly), just the right weight of denim and straight legs that glide effortlessly over the “Fryes” you just added to your coveted boot collection. As your hands work their way deftly through the rows of indigo they stop on what appear to be that perfect “made in heaven” pair. Until you turn them around. Astonishingly, right there, on the back pockets. Bling. In whose world does bling belong on an otherwise perfectly tailored pair of jeans? There’s nothing about it that makes sense. I can’t think of one reason I would want to have rhinestones sticking into my backside every time I sit down. Nor can I imagine pulling out my jeans the next time someone invites me to their kids Bar Mitzvah, one of the few occasions where bling might be part of my fashion repertoire. Jeans are about comfort. Rhinestones are not. It’s simply incongruent and, if I may say so, borders on offensive because there are places for bling and places where it is quite simply wrong. And the back pocket of jeans is one of those places. So I just don’t get it. Or one size fits all. Really? Let’s pretend I’m 5 foot nothing and just shy of 105 pounds. I go to my local department store to pick up a pair of leggings, mostly because they’re rather fashionable these days. As I sift through the myriad of options I notice a particularly attractive pair that meets my fancy. On closer scrutiny however, I find myself cringing at the “one size fits all” pronouncement prominently displayed on the front of the package. So you’re telling me that this single pair of leggings is going to fit both me and the long legged beauty who at this very moment is standing behind me, virtually reaching over my head to pick up the very same pair that I have cradled in my own hands. Who thought that one up? Please tell me how one can possibly make sense of this. Which fashion honcho came out of a meeting where a group of geniuses decided that the same amount of fabric would suffice for my legs and hers? Let’s face it. One of us is going to have to make some mighty uncomfortable adjustments to make this happen. Maybe this was a mistake. The more I think about it the more it seems to me that while I don’t really get this stuff it is entirely possible that this “stuff” causes me just a tiny bit of irritation. And as I emerged from the shower (have I mentioned that some of my best ideas come to me in the shower?) it occurred to me that I might be on a bit of a roll and there are, in fact, even more things that cause me a tiny bit of irritation. Like car salespeople who ask me for my favourite colour . And squirrels that eat my car. Not to mention people who “like” my blog for the sole purpose of getting me to like theirs. I hate to say this but it seems to me that this just might be “Part 1” of a many part series. Well at least now I’ll have something to do while I wait for the kid to get home from the bar.